j2og. 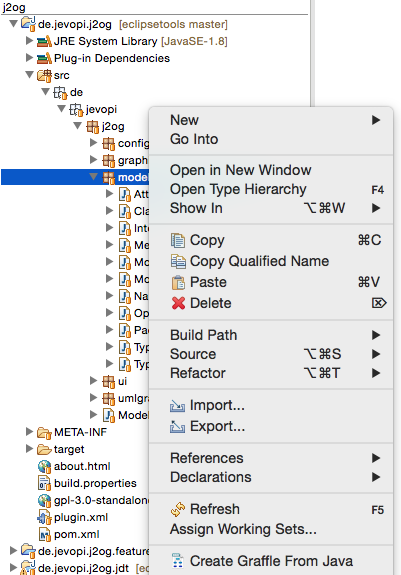 Create OmniGraffle class diagrams from your Java sources and more. OmniGraffle is a great diagramming tool for Mac OS X. 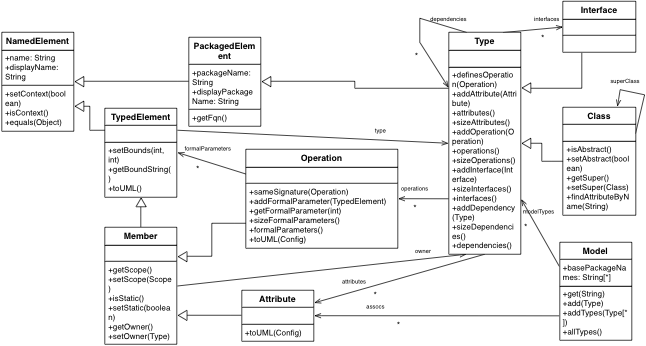 The Eclipse plugin j2og adds a new menu entry to the Eclipse package explorer, so that you can automatically create class diagrams in OmniGraffle from your existing Java sources. Additionally it is possible to also create diagrams from EMF ecore or Xcore files (in case you don't like the ecoretools for stability or aesthetic reasons ;-) ). Its usage is very simple: Select "Create OmniGraffle Diagram" from the context menu of a java source file (i.e. compilation unit) or package in the package explorer. 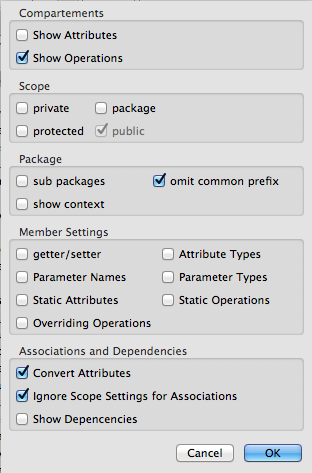 You can then configure the output (default settings can be defined in the preferences), and the plugin will scan the package and add a class diagram of this package. The diagram is saved to some OmniGraffle file. For ecore/xcore files, just select "Create Graffle from EMF". The exported diagram is not really layouted, but you can easily do this with your diagramming tool. In order to better see relations between classes, you can force to draw all associations, even if they would be filtered out by the scope filter. The newly created shapes are initially drawn using OmniGraffle's hierarchical layout algorithm. Unified version numbers, added maven build, fixed some bugs. Renamed to "j2og". Used AppleScript (cf. Peter Friese's blog post) to create drawing, required installed OmniGraffle application. Did not work with newer OS X and OmniGraffle versions, this is why is has been rewritten.